A wind up phonograph is signed "Pathe Freres," licensed by the French company for production in the USA about 1915. The firm was most famous as a maker of movies and of movie camera equipment. The quarter sawn oak case has a very fine original finish in remarkable condition. In excellent working condition, there is a speed control and on/off switch. The nickel arm supporting the lid needs a tricky finger action to close. Size is 18" wide excluding the removable crank, 20" deep and 42" tall. 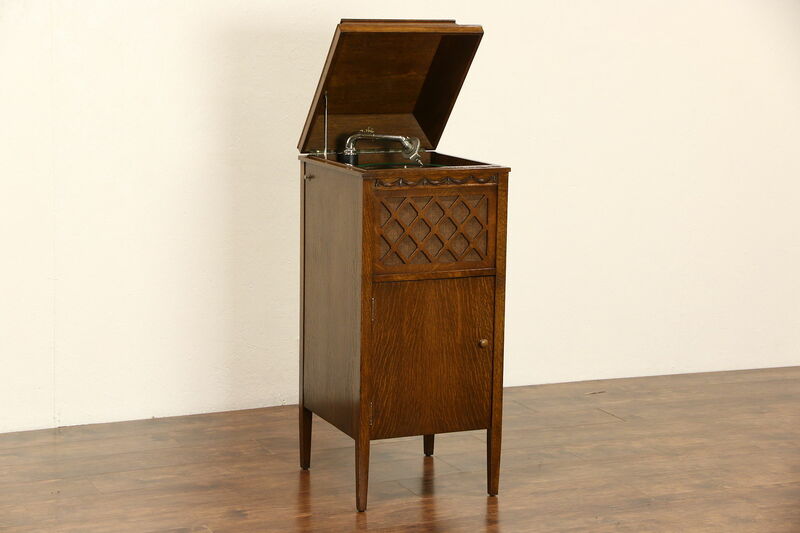 A selection of old 78 rpm records is included with this antique furniture. Gallery website that enlarge to full screen size.